Study Plan and Lecture Notes. 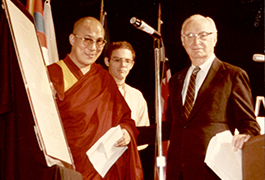 Albert Outler with Dali Lama. 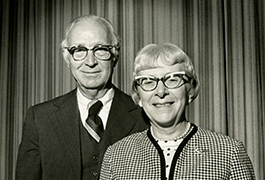 The Albert Cook Outler Papers comprise the largest and one of the most significant archival collections at Bridwell Library. 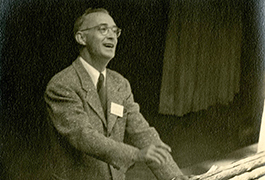 Dr. Outler (1908–1989) was a world-renowned theologian and Wesley scholar who served on the faculties of Duke University (1938–1945), Yale University (1945–1951), Perkins School of Theology (1951–1979; professor emeritus 1979–1989), and Texas Wesleyan University (1983–1984). 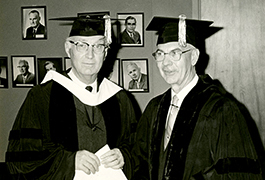 Outler’s professional library and personal papers were donated to Bridwell Library through the advocacy of Rev. Bob W. Parrott. From 2010 through 2014 library staff processed the Albert Cook Outler Papers in order to make the collection more accessible to the public. Archival processing includes arranging materials into thematic or format-based units called series; removing redundant and out-of-scope materials; addressing preservation needs; and publishing a finding aid that describes the collection’s subject, history, arrangement, and contents. 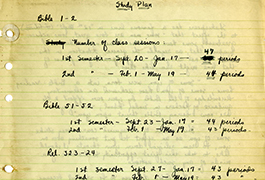 The digital collection for the Outler papers will provide access to additional materials including manuscripts, publications, photographs, audio, and video. Researchers will be able to fully investigate Albert Outler’s rich legacy as a churchman, scholar, theologian, author, teacher, and ecumenicist. 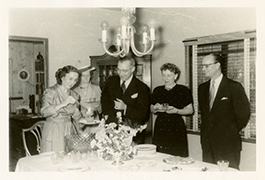 Bridwell Library opened the Albert Cook Outler Papers collection in February, 2015 with a celebration held during Ministers' Week at Perkins School of Theology. For more information about the Albert Cook Outler Papers at Bridwell Library, please contact Bridwell Library Special Collections.